Power Consumption 1.0 kW / Hour. Machine Dimensions Height - 1500 x Width - 950 x Length - 1050 mm. Production Speed 35 to 40 pouches per min. Pouch Style Three Side / Four side sealing. 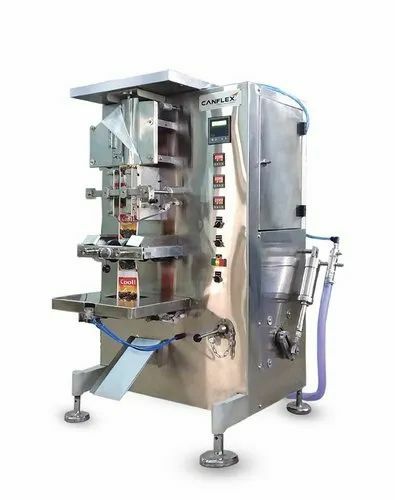 Single head mechanically operated fully automatic form; fill & seal machine to pack "Free Flow liquids" like Liquid, Oil, and Juice. In heat sealable laminated poly pouches, with pump operated feeding system. Feeding head Pump operated feeding system. Net Weight 260 kg (Approx). Inner Core Dia of Film Roll 70mm. Outer Dia of the Film Roll Upto 350mm. Power Requirement Single Phase,220 V 50Hz. Established in the year 2002, we “Canflex Engineering Pvt. Ltd.(Cannon)” are one of the noted manufacturers, exporters of Automatic Form Fill Seal (AFFS) Machines/Pouch packing machines.